That right there looks like a cookie, right? Well it's not. It's overcooked sugar with pistachios in it. It's what should have been pralines with pistachios in it. It is, in a word, failure. I'd never made pralines, obviously. I have no idea why I decided to try them, or even look for a recipe online. But it turns out what I found, despite seeming very simple and straightforward, left out a very important step. It's the step that turns syrup-like caramel into a more solid, praline-like existence that keeps its shape. The important step? Stirring. You have to stir the syrup until it loses its gloss then very quickly drop spoonfuls of it. I didn't know that, and ended up with a mess of caramel-covered pistachios all over my parchment-lined baking sheets, trying to figure out why it was so syrupy. So I kept on cooking the last bit of caramel that was still in the pot, taking it up to hard ball stage (250° F) and it turned this nice dark brown. When I dropped it on the baking sheets, it firmed up immediately. That's when I found another recipe, then a video, and realized the all-important stirring step. Too irritated to try again, I simply scooped up all the caramel and tried to find something else to make with it. For once, I was able to improve upon failure and create something wonderful. But that's a story for another day. 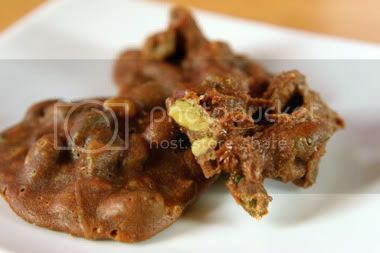 Adapted from a Simply Recipes recipe for pralines. There will be bubbles and maybe some splatters while making this. Wear long sleeves!